A Northern California Native American activist is calling on the Oakland Raiders to apologize for a tweet by its new radio broadcaster, Brent Musburger, that joked about U.S Senator Elizabeth Warren's American Indian heritage. Musburger, the longtime TV sports commentator, tweeted a photo on Saturday of President Trump with several men behind him at a rally wearing traditional American Indian headdresses with the text: "Elizabeth Warren's 'relatives' backing Trump in Montana!" Musburger was making reference to the Democratic Senator from Massachusetts' claims that she is of Native American descent, which the president has often mocked. The Raiders have yet to respond to a request for comment about the post, nor has the organization made any public comment about Musburger's tweet. "Their silence equals complicity," said Morning Star Gali, an Elk Grove-based community liaison coordinator with the International Indian Treaty Council and a member of the Pit River tribe. Gali, who was born and raised in Oakland, described Musburger's comments as a ridiculing attempt to use stereotypical imagery to discredit American Indians. She said that Trump's continual reference to Warren as "Pocahontas" is harmful and incredibly troubling. Tribal communities in the Northern California region have long been fans of the Raiders, Gali said. "Generations of us are raising our children as Raiders fans. Our parents and grandparents are Raiders fans," said Gali, who helps organize the annual Alcatraz Sunrise Gathering. "Overall, it was just so disappointing." His latest tweet was not the only time the 79-year-old announcer has said something offensive. He famously criticized the African American athletes who protested at the Mexico City Olympics in 1968, deriding them as "black-skinned storm troopers." "I honestly can't say that I fell out of my chair in surprise," said Daniel Durbin, the director of the USC Institute of Sports, Media and Society, referring to Musburger's long history with statements that are perceived by some as racist or sexist. Durbin says what players, and even broadcasters, do on social media can reflect on their franchises. 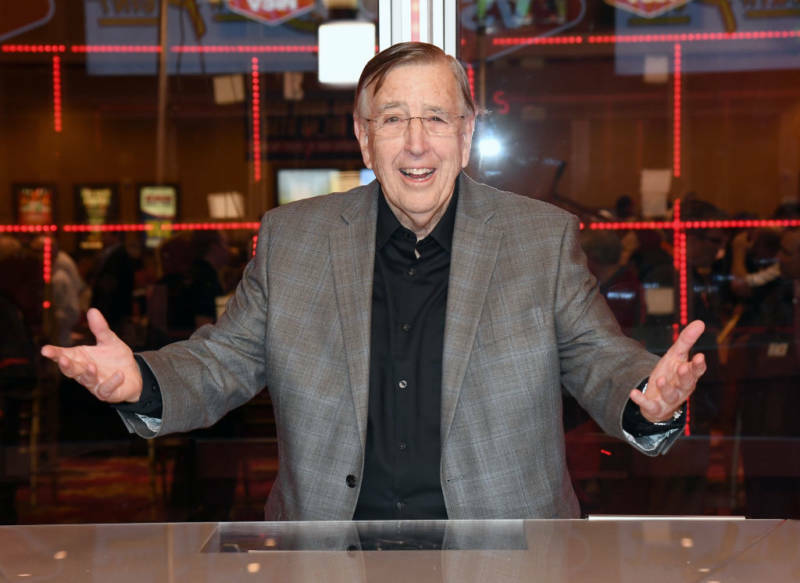 "Musburger wrote a tweet that really pushed the lines of good taste especially in our day and age and it really put the Oakland Raiders in a bad light," he says. "It doesn't help the NFL's image either." One of the leaders of the agency that oversees the Oakland Coliseum, the stadium where the Raiders play their home games, was not happy with Musburger's tweet either. "As a long time Raiders fan, we were all upset that the Raiders found the need to replace Greg Papa with Musburger," said Chris Dobbins, President of Save Oakland Sports and a Commissioner on the Coliseum Joint Powers Authority. "You have a public job," Dobbins said of Musburger. "You can make comments that support your political views without trashing somebody else." 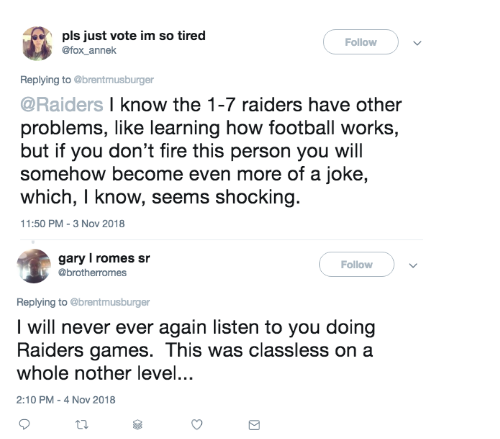 Raiders fans and sports nuts alike have clamored to condemn Musburger's comments on Twitter, calling him an "ignorant bigot", while others are demanding his dismissal. For Morning Star Gali, Musburger's comments were just the latest insult from the NFL to the American Indian community — many Native Americans have long been upset over the Washington Redskins name and logo. "Again, we're being ignored when it comes to issues that are harmful to our community," she said.